Worth the cash if you want to put your Live Mixer on a second monitor. But that's all it does. 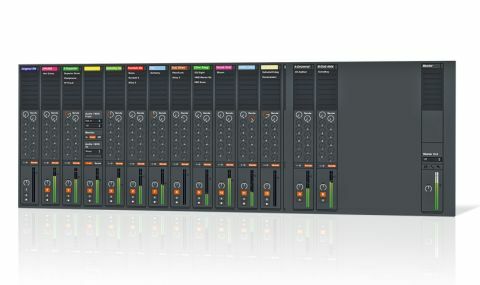 A Max For Live patch, Ultimate Mixer duplicates the famously immovable Ableton Live mixer in its own window, complete with stretchable channel strips, I/O and monitor control, 12 Send knobs and track colour assignment. It also displays the names of all loaded insert effects and instruments. "Ultimate Mixer duplicates the famously immovable Live mixer in its own window"
There's a decidedly indie feel to it that pleases as much as it irritates (each channel has its own track colour picker, for example, rather than all of them sharing a single contextual one; and the contents of Groups can't be viewed), and ultimately, the only real reason to buy it would be to put your Live mixer on a second monitor. That's a perfectly valid cause, for sure, and probably worth the asking price, but don't be under the illusion that this will improve your Live mixing experience in any significant way beyond it. At the top of our future version wishlist are the ability to launch plugins from their insert slots and better auto-sizing behaviour to maximise usage on high-res monitors.